The leaders involved in NLM’s Biomedical Informatics Course read like a who’s who in biomedicine: Michael J. Ackerman, Jim Cimino, Paul Clayton, Dina Demner-Fushman, Dan Masys, Clem McDonald, Joyce Mitchell, and Homer Warner. For 24 years, the staff offered an immersion into an initially new, yet still rapidly growing research area that blends library, engineering, computer, and biomedical sciences and has real-life applications, such as clinical decision support. Just as the week-long course was innovative and cutting edge when it was created in 1992, NLM is now envisioning new ways to educate librarians and informaticists given the Library’s burgeoning work with data science and biomedicine. After a quarter century of progress, it’s time to re-imagine the course’s future. When the course began, there were few options for people interested in the nexus of health and computing. Recognizing that gap, Donald A. B. Lindberg, MD, then-director of the National Library of Medicine, conceived the course, bringing together professionals to learn about medical informatics from experts in the field. Initially offered once a year, the course later expanded to two times each year to accommodate growing interest. First hosted by the Marine Biological Laboratory in Woods Hole, Massachusetts, the immersive course moved to Young Harris, Georgia, in 2014, where it was hosted by the faculty and staff of Augusta University. Over two-plus decades, NLM and its partners introduced more than 1,600 participants—librarians, physicians, nurses, dieticians, and educators—to biomedical informatics. The course altered participants’ career directions, expanded their ability to impact their own institutions, and changed the field of biomedical informatics itself. One study found the course influenced participants’ engagement with information technology-related activities, such as selection and training; shaped their development of undergraduate and graduate informatics curricula; and encouraged their own continuing education. That was 1993, and all of my graduate training had mostly been the traditional model of classroom learning. It was a time when web browsers were just becoming known, the Gopher tool was still new, and so on. I went back to my job at University of Rochester and was a huge hit showing Gopher’s capabilities to med school faculty. We also had hands-on with Homer Warner’s Iliad system. I didn’t ever use that program again, but it was a great experience in what decision support can or can’t do. I was paired with an MD (it was librarians and clinicians), and both of us got to practice interdisciplinary teamwork. He worked at Kaiser Permanente and went on to a career in informatics. [I appreciated learning about] the resources available through NLM and NIH and how to incorporate those resources throughout various aspects of informatics. So much was helpful: from study design, evaluation planning, and how to incorporate these resources in our planning. This has been a great immersion experience that will take a long time to digest the great amount information we received. I enjoyed the small group exercises and learning from some of the other fellows. This was fantastic. Great collection of speakers. Brenda Seago and her team have done an exceptional job. The whole experience was well organized and planned. I’ve been to a lot of “events,” and this is definitely in the top five on usefulness, organization, and execution. Logistically well-organized down to the smallest of details. Staff was welcoming, warm, and always helpful….The course—one of the best experiences I have had in my professional career. Such positive feedback would not have been possible without the strong partners NLM found in Woods Hole and Augusta University faculty. 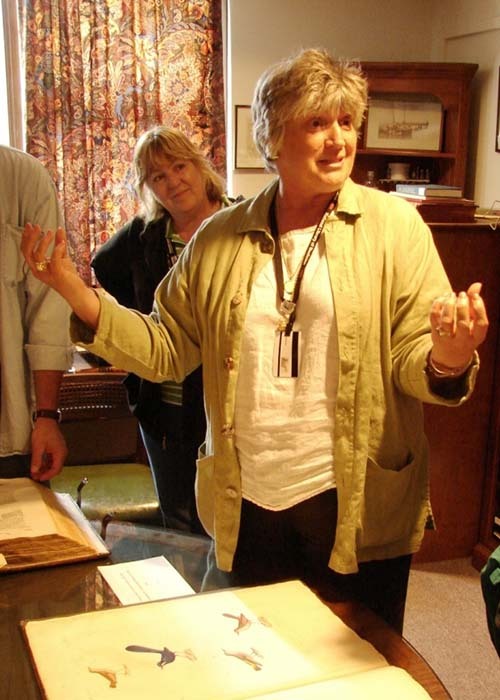 The library at the Marine Biological Laboratory, led by Cathy Norton, opened up the educational possibilities of computing power. The partnership with Augusta University, under the direction of Brenda Seago, built on this foundation and added new capabilities to the course. An online content management system gave participants access to agendas, readings, and slides sets in advance and links to lecture videos for a full year following the course. Augusta University faculty and staff also provided extensive information technology support, implementing an audience response system to encourage and engage participants. Over two decades, an established biomedical informatics community took root, with formal coursework, self-study, continuing education, and other professional development options, largely due to the seeds planted by the course and other NLM training efforts. Now Rex Robison, head of the Training and Outreach Unit in Library Operations at NLM, is leading a group to shape a successor to the NLM Biomedical Informatics Course. The restructuring process will take into account NLM’s strengths and goals, as well as the needs of the biomedical library and informatics communities. The group is looking forward to developing the next iteration of this legendary course, while preserving at least one of its key characteristics. 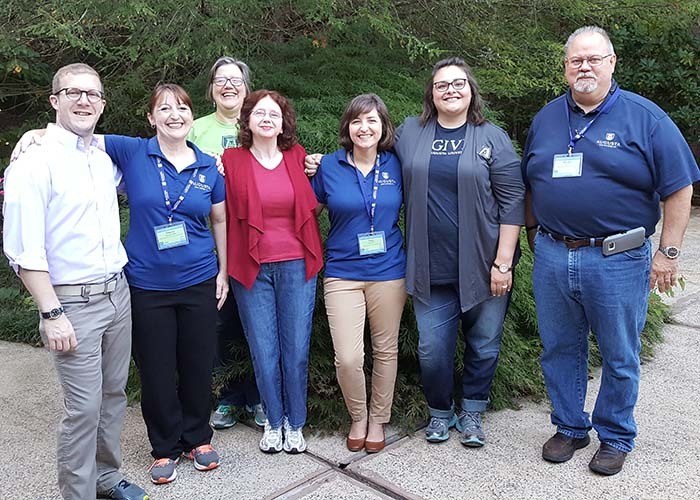 Robison, a 2013 alumnus of the course, hopes to maintain its collegial aspects so students can establish connections with each other and with NLM. How would you like to see the course evolve? Let us know below. NLM gratefully acknowledges the teams at the Marine Biological Laboratory, Woods Hole Oceanographic Institute (1992–2012) and Augusta University (2013–2017) who expertly managed support for the NLM Biomedical Informatics Course. Augusta University: Brenda Seago, professor and director of libraries, and principal investigator; and Kathy Davies, project leader. Faculty and staff: Sandra Bandy, Randle Berlin, Marianne Brown, Sara Bryan, Caro Cassels, Ashley Cullum, Sandy Drapeau, Ginny Durham, Adrienne Hayes, Artemas Jones, Gail Kouame, Georgiana Laws, Erick Lemon, Jillian Oliver, Peter Shipman, Amy Triana, Tammy Westafer, Paul Wheeler, and Grace Xu. Marine Biological Laboratory, Woods Hole Oceanographic Institute: Catherine Norton, director of library services. Staff: Judy Ashmore, John Furfey, Dave Remsen, Diane Reilinger, Amy Stout, Eleanor Uhlinger, and Jen Walton. October 17, 2017 in Programs & Services. obsolete in the era of big data? If you would like me to attach the full paper, please send me an email address. Thank you, Dr. Fine. We’ll check it out. I’m very excited to see where this goes! I have no doubt that Rex will lead things in a great direction. 🙂 I do think the interdisciplinary aspect is really important as silos continue to create barriers. And in my current status as a medical librarian turning genetic counselor, the trends I see range from telegenetics (to support inclusion of rural communities in both healthcare and research) to effective EHRs (family histories and genetic test results that aren’t just scanned; automatic flags for appropriate referrals) to bioinformatics pipelines for genetic variant classification (and presumably similar pipelines for the proteome, epigenome, metabolome, transcriptome, etc.!). Thank you for your awesome effort in restructuring the NLM Biomedical Informatics Course restructured. I work for a company in Bethesda. We do support NLM in several projects. I would like to find out that once you have the next the NLM Biomedical Informatics Course restructured, can I participate and attend as a student?. Thank you for your question—and your interest in biomedical informatics. We’d be happy to add your name to a list of people interested in future offerings from NLM. I would love to be added to the wait list, as well. I’ve heard great things about this course.